"The Dreamer" by Djuna Barnes was offered by Poets.org's Poem-A-Day on March 1, 2014. A link to the poem may be found here: http://www.poets.org/viewmedia.php/prmMID/23906?utm_source=PAD%3A+The+Dreamer+by+Djuna+Barnes&utm_campaign=poemaday_030114&utm_medium=email. 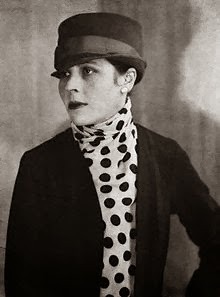 Djuna Barnes (1892 - 1982) (pictured) was a reporter for McCall's who was sent to France as a correspondent. She wound up staying for twenty years and immersed herself in the modernist scene in Paris, becoming part of a group of female literary figures who eventually became known as the Literary Women of the Left Bank. She is perhaps most famous for her novel, Nightwood (1936), called by some a long poem. "The Dreamer" was originally published in 1911 and was Barnes' first published work. Additional biographical information may be found here: http://www.studiocleo.com/librarie/barnes/biography.html. "The Dreamer" is presented in three quatrains. The first and third lines of each quatrain are rhyming, and the second and fourth lines of the first quatrain also rhyme (just). The fourth lines of each quatrain begin with "faith" followed by an exclamation. The images in the poem are dark and fleeting, as in a dream. I was reminded of the work of Edgar Allan Poe.